KNAUER offers about 6,000 columns for HPLC, UHPLC, and FPLC separations as well as preparative scale columns for purifications. 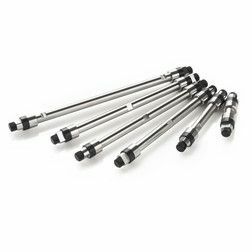 Liquid chromatography columns from KNAUER are known for their reliability and robustness for more than 40 years. In the field of analytical HPLC columns we can offer a solution for nearly any analytical problem. KNAUER offers all typically used phases, which are used in the application fields of environmental, food, pharmaceutical and chemical analysis as well as many other fields.